So, I was in Morrisons a couple of weeks ago and I wandered down their fresh ready-meals section (it’s on the way to their discount shelves, and I love me some yellow stickers). I was casting a lazy eye over the pasta sauces when one jumped out at me. It was a little pot of bright red goo entitled Chorizo and Red Pepper Sauce. “Ooooooo” I thought. “That looks tasty!”. And lo and behold, there was some lovely fresh spinach raviolo on the discount stand that would go perfectly with it. But did I buy the sauce? Did I buggery. I bought some peppers and some chorzio and made my own. It was one of those things that’s a joy to cook — really easy, really satisfying, and something that looks and smells delicious even before it’s finished. The next day I cooked the leftover bits of pasta hanging round my cupboards, tossed it in this sauce and served it for lunch. It was blooming AMAZING. This is my recipe for this sweet, spicy and flavourful sauce. I do hope you like it. What a unique flavor combo! This sounds great! 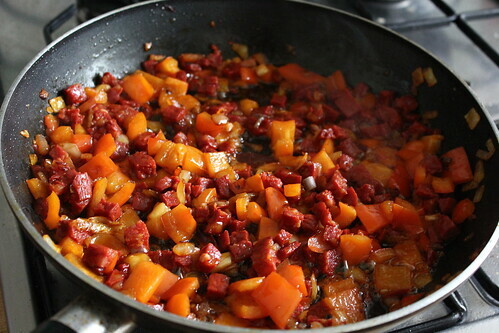 Ooh I love chorizo and this looks like a really tasty pasta sauce. Nice recipe! So happy to discover your blog today, can’t wait to read more! Love the sound of this and I love that you went and made your own. I never really bother with pasta because I get bored of the all the sauces but I bet I wouldn’t get bored of this! Made this yesterday and had for lunch today….I was VERY impressed! Gorgeous flavours and really easy to make. Thank you!! I made this tonight for tea, it was delicious. I added a slug of Worcester sauce and some tomato purée. Hmm!